HINT: It is not necessary to completely remove the roof headlining. Slightly lower the front section of the roof headlining so that the windshield glass can be removed later in step 19. (b) Using a screwdriver, pry out the 5 clips. (c) Using a screwdriver, pry out the hooks and windshield moulding outside LH. (a) Using a drill of less than f 4 mm (0.16 in. ), gently and perpendicularly place the drill tip onto the rivet and cut the rivet flanges. HINT: Wind tape around the drill blade so that the drill blade appears approximately 5 mm (0.20 in.) on the edge. Be sure to gently place the drill perpendicular to the rivet to prevent the rivet hole and the drill itself from being damaged. Be careful as the cut rivet will be very hot. (b) Even if the flange is taken off, continue drilling and push cut the remaining fragment with the drill. (c) Remove the windshield outside moulding clip No.1. (a) Using a knife, cut off the moulding, as shown in the illustration. NOTICE: Be careful not to damage the vehicle body with the knife. (b) Remove the remaining moulding. HINT: Make a partial cut in the moulding. Then pull and remove it by hand. (a) w/ Window defogger: Disconnect the connector. (b) From the interior, insert piano wire between the vehicle body and glass, as shown in the illustration. (c) Tie objects that can serve as handles (for example, wooden blocks) to all wire ends. HINT: Apply protective tape to the outer surface of the vehicle body to prevent its surface from being scratched. When separating the glass from the vehicle, be careful not to damage the vehicle's paint or interior/exterior ornaments. To prevent the safety pad from being scratched when removing the glass, place a plastic sheet between the piano wire and safety pad. (d) Cut through the adhesive by pulling the piano wire around the glass. (f) Using a suction cup, remove the glass. NOTICE: Leave as much adhesive on the vehicle body as possible when removing the glass. (a) Using a scraper, remove the damaged stoppers, dams and adhesive sticking to the glass. (b) Clean the outer circumference of the glass with white gasoline. Even if using new glass, clean the glass with white gasoline. (a) Coat the installation part of the stoppers with Primer G.
Allow the primer coating to dry for 3 minutes or more. Throw away any leftover Primer G.
(b) Install 2 new stoppers onto the glass, as shown in the illustration. 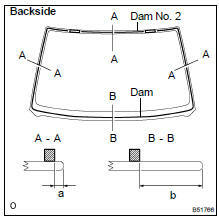 (a) Install 2 new stoppers to the vehicle body, as shown in the illustration. 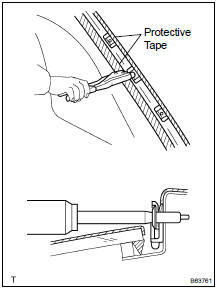 (a) Coat the installation part of the windshield glass adhesive dam with Primer G.
Do not apply too much Primer G.
(b) Install a new dam, applying double-sided tape all the way around the glass except where the stoppers are installed, as shown in the illustration. (a) Clean and shape the contact surface of the vehicle body. Using a knife, cut away any rough adhesive on the contact surface of the vehicle body to ensure the appropriate surface shape. NOTICE: Be careful not to damage the vehicle body. HINT: Leave as much of the adhesive on the vehicle body as possible. Clean the contact surface of the vehicle body with a piece of shop rag saturated with cleaner. HINT: Even if all the adhesive has been removed, clean the vehicle body. Using a suction cup, place the glass in the correct position. Check that the whole contact surface of the glass rim is perfectly even. Place reference marks between the glass and vehicle body. NOTICE: Check that the stoppers are attached to the vehicle body correctly. HINT: When reusing the glass, check and correct the reference mark positions. Using a suction cup, remove the glass. (c) Using a brush, coat the exposed part of the vehicle body with Primer M.
Throw away any leftover Primer M.
Do not apply too much Primer M.
(d) Using a brush or sponge, coat the edge of the glass and the contact surface with Primer G.
Cut off the tip of the cartridge nozzle, as shown in the illustration. HINT: After cutting off the tip, use all adhesive within the time described in the table below. Load the sealer gun with the cartridge. Coat the glass with adhesive, as shown in the illustration. Using a suction cup, position the glass so that the reference marks are aligned. Press it in gently along the rim. Check that the stoppers are attached to the vehicle body correctly. Check that the vehicle body and glass have a small gap between them. Lightly press the front surface of the glass to ensure that the glass is securely fit to the vehicle body. Using a scraper, remove any excess or protruding adhesive. HINT: Apply adhesive on the glass rim. NOTICE: Do not drive the vehicle for the amount of time described in the table below. (a) Place a new moulding onto the vehicle body and tap it by hand. (a) Conduct a leak test after the adhesive has completely hardened. (b) Seal any leaks with auto glass sealer. 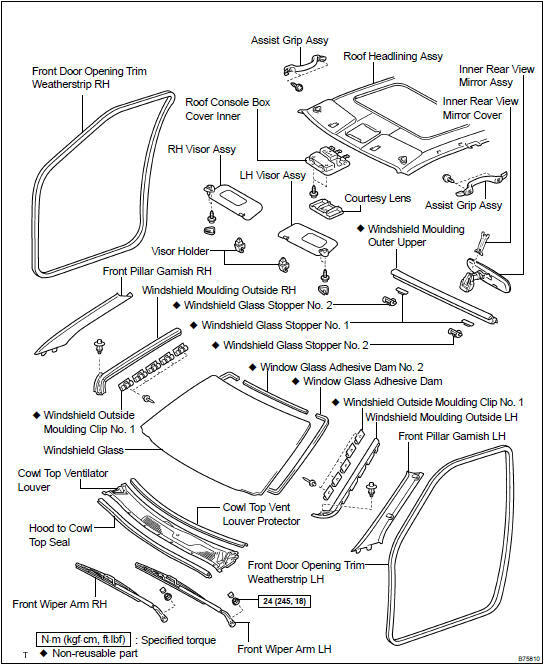 (a) Using an air riveter or hand riveter with nose piece, strike rivets into the body panel to install the windshield outside moulding clip No. 1 to the body panel. If the rivet is not positioned perpendicularly, it will bend the mandrel. When trigger is then pulled, it may damage the rivet's mandrel. Do not prize a riveter, because the riveter will be damaged and the mandrel will be bent. 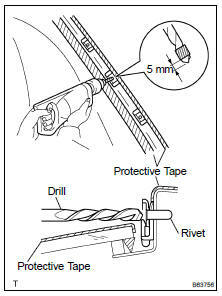 Do not tilt the riveter when removing the rivet, because the materials are not tightened firmly. Install the rivet while attaching the materials, because they are not tightened firmly.